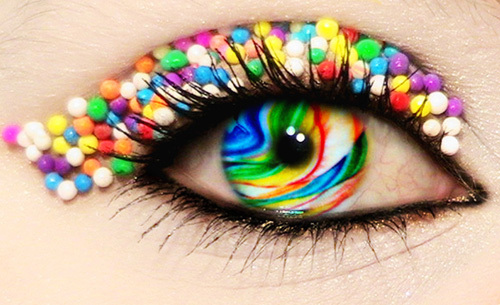 'Eye candy': Sweets for the eyes... to be savored in small doses or devoured in abundance, always a treat and zero calories. Or by dictionary standards: "Someone or something attractive."... but one man's junk is another man's treasure. Taste is personal... "Beauty is in the eye of the beholder"... and personally, I find this spring collection by designer Alexis Mabille well suited to my quirky taste and absolutely delicious. 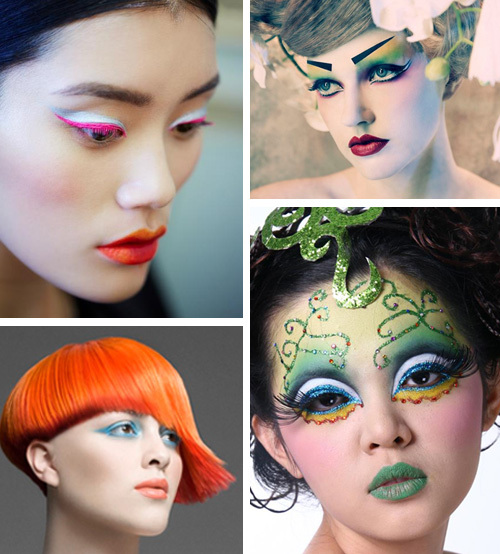 So too these make-up looks, some dramatic and some subtle by comparison. 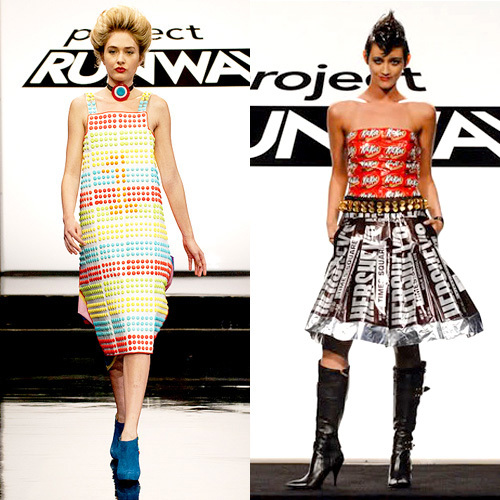 I do enjoy 'eyeing' couture and watching reality shows like 'Face Off' and 'Project Runway', where talented artists create theatrical looks and 'over the top' designs, and where unconventional challenges using materials like sugar coated dots, gummy fish, and 'Twizzlers', produce garments worth licking. Hopefully, I haven't given you the impression that I'm obsessed with fashion and make up. One look in my closet at my limited 'Target' attire and a peek into my cosmetic drawer containing just a single tube of Aveda Crystal Mint lip gloss and two shades of Revlon Colorburst lipstick should prove my point. Eye candy can be found anywhere and everywhere, but usually it finds you! When your eyes get wider and your lips begin to part making sounds like ooooo and ahhhhh, to where you want to devour all that you see, which thankfully you can because you haven't actually ingested a thing, that's when you know you've found it. Sometimes eye candy comes in a box and sometimes the box is the eye candy! ... candy boxes once framed and hung in my studio simply because I liked the way they looked. I like being surrounded by colorful, inexpensive, 'attractive' things, sometimes keeping the box or wrapper and tossing the contents... cheap thrills that 'float my boat'. ... most unattractive on the outside, but with tasty bits on the inside. It was given to me while visiting a friend at 'the Philadelphian', a condo located across the street from the Philadelphia Museum of Art. Chester, the doorman, said I was special, even though he never met me before and let me choose a treat from a large assortment of candy inside a grocery bag. Sweet! This time I tossed the box and ate the contents to the tune of 170 shared calories! In fact, I've never been on a diet. Not The Atkins Diet, The Zone Diet, The Dash Diet, The Mediterranean Diet, The Macrobiotic Diet, The Fast Smash Diet, Pritikin, those with a California connection... LA Weight Loss, The South Beach Diet, The Sonoma Diet, and The New Beverly Hills Diet, diets with food portioned in packages like: Weight Watchers, Jenny Craig, and NutriSystem. Not Medifast, The Slim Fast Plan, Sugar Busters, Volumetrics and Dr. Oz's "You-On-A-Diet", pointing out that it is indeed me trying to get trim with emphasis on waist measurement, not weight. The High School Reunion Diet, which promises you'll look slimmer, younger and healthier in 30 days in time for that reunion, What Color Is Your Diet?, perhaps a diet for artists or interior designers, that includes eating more fruits and vegetables with color, and another color plan called P.I.N.K., a low calorie plan with rigorous exercise that stands for Power, Intensity, Nutrition and 'Kardio'. "Oh my"! Certainly not these wacky ones... The Cookie Diet where you eat dinner while the rest of the day you munch on cookies, at least six of them!, The Lip Gloss Diet with the slogan... "Always on the lips, never on the hips. ", with slenderizing gloss oozing with ingredients that supposedly curb your appetite, and this one that sounds so easy, The Sleep Diet... "If you aren't awake, you're not eating", which focuses on your Cortisol levels along with Leptin and Gherlin hormones that trigger appetite. None of these odd item diets like The Egg Diet, The Banana Diet, The Cabbage Soup Diet, The Baby Food Diet, or the 'five dollar foot long'... Subway Diet. And never this one... The Hallelujah Diet... a low calories vegan diet created by Reverand George Malkmus and his wife Rhonda developed on their Hallelujah Acre Farm as 'God's way to optimal health'. Honestly, I'm not making any of this up. Instead, I've always sided with Julia Childs who said, "The only time to eat diet food is while you're waiting for the steaks to cook." One night she woke up from a dream screaming in a cold sweat because the gum she was chewing wasn't... sugar free! She attributed the nightmare to four weeks of eating hard-boiled eggs and Forman-grilled hot dogs... and admitted to gaining back all the weight she lost the minute she touched a potato. A rather sad tale, which only proves that most diets are too restrictive, make people crazy, and in the long run... don't work. So why is Monday, March 25, 2013 circled on my calendar? By law, don't all diets begin on a Monday? Yup... I'm on a diet. Dr. Michael Mosley's book titled, 'The FastDiet', his research, and scientific evidence showing that intermittent fasting drops pounds and reduces the risk of diabetes, cardiovascular and other diseases convinced me to give his diet a try. Rather than some kooky fad diet, this is more of a life style change with little restriction that's easy to do and one that I can see staying on for the long haul should it prove effective. 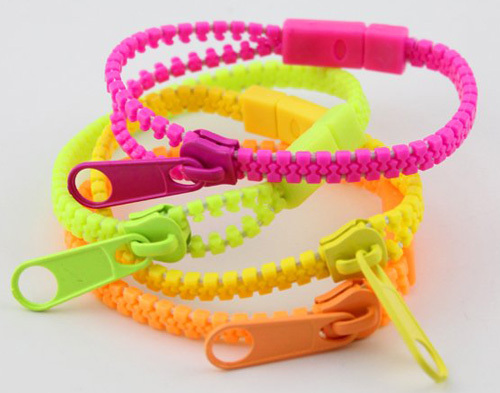 ... zipper bracelets... the latest in eye candy among tweens, teens, and now me. I wear them on Mondays and Thursdays, the two days a week that I limit my eating to just 500 calories each day divided between breakfast and dinner with nothing eaten between those two meals. The rest of the week I eat what I choose. And if I choose carefully, 'zipping' my jeans should become a breeze. Plus, I like these colorful accessories. They're cute and great reminders to keep my mouth zipped on dieting days. For now I have something to lose (weight) and everything to gain (good health). ... skinny jeans in eye candy colors! Dieting... what are your thoughts or experiences? What kinds of things make your eyes pop and your lips go ...ooooo & ahhhhh? 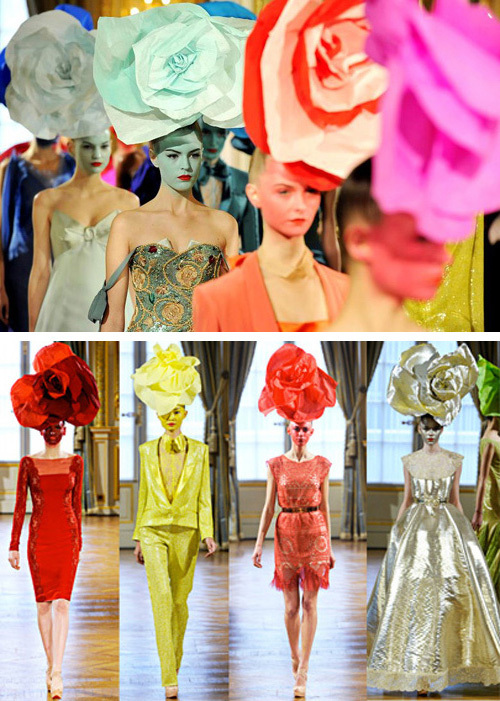 Alexis Mabille's 2012 spring collection in motion here. A brief interview with Dr. Michael Mosley about his 'FastDiet' here. 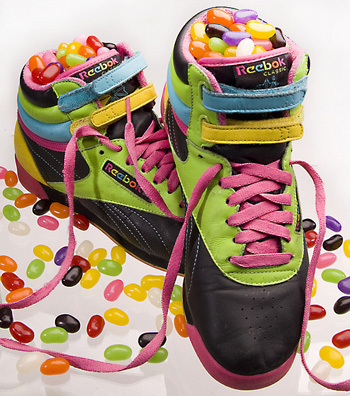 Who runs anywhere with jelly beans in their sneakers? in the 1960's, in conjunction with the eyebrows of Sally Starr (your gal "Sal" as she called herself), which first initiated an almost literal concept of eyecandy. Her brows which were designed, wavy lines, would capture my attention each night as she enchanted kids in Philly with her cartoon program....Before I knew it, I began to draw eyes in all different shades and sizes, over and over again-filling up tablet pages. Surrealism and pop-art were wedded and becamea mindful pursuit til this day...Now diets are a different pursuit in the name of comfort and beauty. Just the other day, I recommitted myself to keeping a food section in my daily journal. Not one for following a particular type of diet, just following current trends and commmon sense about my eating habits. Sounds like you had an eye for 'eye candy' long before the term was invented. Having not grown up in Philadelphia, and no clue to this wavy eyebrow wonder, Sally Starr, I did some research and can see how, as a youngster, you found her 'eye catching'. So too 'Pop Art', which left such a strong impression on me that I ended up with a life in the Arts. Good luck with your attention to the foods you're eating and your journal writing. I imagine a conscious awareness towards anything is a good step in the right direction towards a personal goal. I'm sceptical about the "Fast diet". Seems like 5 days of eating what you want would undo any loss from just two days of restricting calories. I'm curious to know how it is going. It's amazing how many "diets" there are out there! I've never tried any of them. When I want to lose weight, I've always just reduced my calorie intake by eating smaller portions, eating lower calorie foods and cutting out the junk that I ate to gain the pounds I put on in the first place. I normally eat 2 meals a day, breakfast & dinner. In between I eat yogurt &/or fruit when I feel hungry. Unfortunately, I don't care much for salads and the lower calorie vegetables. I eat them because they are good for me but I'd rather eat hamburgers, fries, doughnuts and all the forbidden fattening foods. One thing I do love that they say is good for you is dark chocolate. I allow myself some now and then as a treat. I love the colorful displays of candy in candy stores. They are a real treat for the eyes. However, they look better to me than they taste. 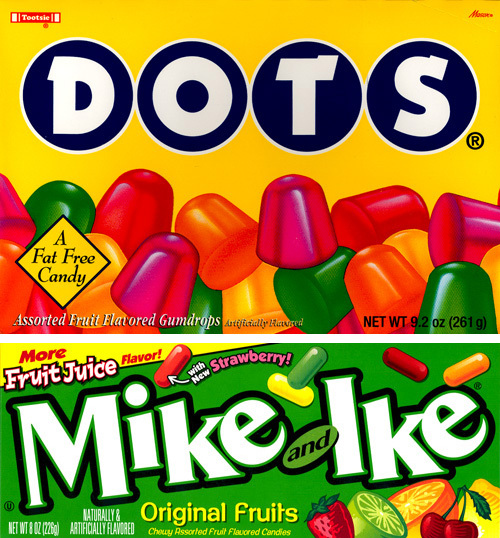 Those types of candies hold no appeal for me. Dark or semi-sweet chocolate....that's what makes me go "mmmmm!" 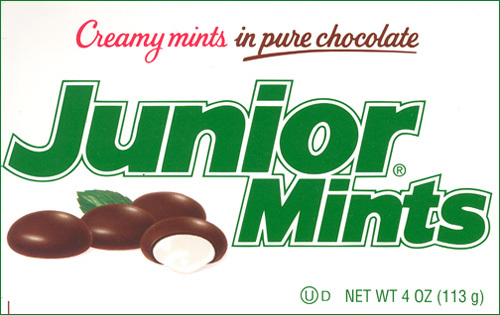 There used to be a little store in our community (Marie's) that sold penny candy. Our parents would take us there on occasion. It was a kid's delight! You got a little brown paper bag and Marie filled it with you selections from the many different candies in the display case. Those zipper bracelets are cute! I haven't seen them anywhere around here. Bevo I have to agree with you... 5 days of eating what you want with only 2 days of restricted calorie intake doesn't seem to make sense. What diet does? Though you sound like you're on a more restricted FASTDIET now... 7 days a week eating only breakfast and dinner. That sounds tough! Dietitians too would agree that cutting down on portion size is the key to losing weight, but so far that hasn't worked for me. So against common sense, I plod on. I've lost a few pounds with little effort and will keep you posted on my progress. Re: Penny Candy Stores... I don't recall going to any, perhaps because I too always thought the stuff looked better than it tasted. I do however remember eating gooey soft ice cream sundaes from Carvel and frappes from Jahns Ice Cream Parlor located next to the Levittown Roller Skating Rink. Desserts just a few thousand calories more than penny candy! Glad you like the zipper bracelets. I'm wearing one now. It's Thursday, my dieting day. Hmmm...Carvel! Dyan, this is fantastic! Love your observations. Great writing. Enjoyed this comical internal dialogue on the connection between, fashion, design, fad-diets and health. Coming from a writer, it's much appreciated.